Furious and worried residents packed an emergency meeting at an East Village apartment building where at 25-year-old Bronx man was crushed by an elevator on New Year’s Eve. 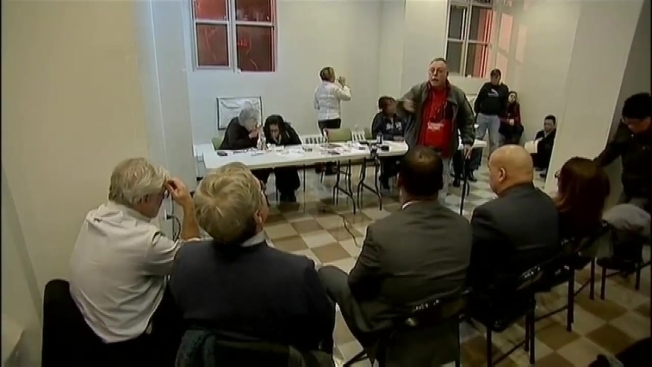 About a hundred angry tenants confronted Grand Street Guild’s management Thursday evening, a little over a week after Stephen Hewett Brown was crushed and killed in an elevator at the building. “I don’t hear you saying ‘I’m responsible.’ Stand up now and say who’s responsible!” one man yelled at the meeting. Some residents said that they’re so afraid of the building's elevators that they’re taking the stairs up and down in the 26-story building. Furious and worried residents on Thursday packed a meeting at an East Village apartment building where at 25-year-old Bronx man was crushed by an elevator on New Year’s Eve. Checkey Beckford reports. “I walked down for this meeting and I’m going to go walk up now,” resident Evelyn Gonzalez said. Tony Saverese, a representative for Wavecrest Management, said that the DOB inspected and approved the elevators. “Then how come somebody died?” one resident responded. Shortly after Brown’s death, NBC New York found that in the last five years there had been 30 311 complaints about the elevators, including two complaints that said they were dangerous. Many residents had stories about being stuck in one of the elevators, including Gloria Molano, who said her 90-year-old mother was stuck just last month. A Bronx man pushed a woman to safety moments before he was crushed to death by an elevator that malfunctioned and trapped him between the car and the shaft on New Year's Eve. The accident occurred at a high-rise apartment building at 131 Broome Street in Manhattan's lower east side. Pei-Sze Cheng reports. “I pray every time I come in. And I’m blessing that everything is working out, because I’m really, really afraid,” Molano said. Dashia Imperiales, a former tenant association president, said that she had been stuck on an elevator too and that she sent an email about how dangerous the elevator was. “It was a possible death trap,” Imperiales said. Wavecrest Management says that the elevators passed inspections by the DOB and independent inspections done by two separate companies in December. The management company also said that a load test that’s done by the DOB every five years has been moved up in light of the deadly accident. The last test was done in 2011.